Semi Automatic Screw Capping Machine is suitable for applying Cap on various type and shape of Vials and bottles with maximum speed of 40 Vials/ Bottles per minute depending on Vial/ Bottle Size and type of Cap to be capping. · Cap Sealing Pressure varied according to different size of caps. · Adjustable gauge provided for different height of bottles. 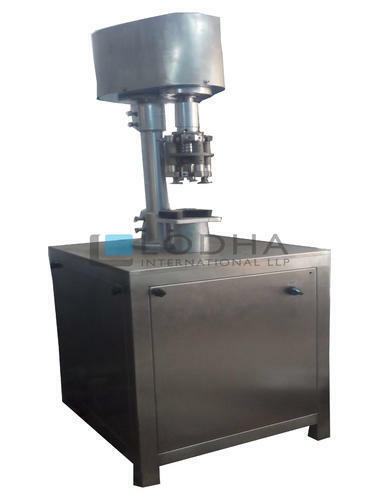 We “Lodha International LLP” are a Partnership firm engaged in manufacturing and exporting high-quality array of Capsule Filling Machine, Automatic Liquid Filling Machine, Capping Machines, Granulation Equipments, etc. Since our establishment in 2006 at Ahmedabad (Gujarat, India), we have been able to meet customer’s varied needs by providing products that are widely appreciated for their sturdy design, high strength and less maintenance.We export our products all over the world. We sell these products under the brand name Lodha. Under the strict direction of “Ms. Monika Jain" (Director), we have achieved an alleged name in the industry. Lodha has developed an exclusive service to pharmaceutical packaging Industry through an uncommon system created by combining experience in both manufacturing and technical aspects. Integration and Innovative thinking have kept us at pace with the requirements of the continuously growing market, adding to our range of services project management, an after sales team and in-house technical assistance. And with the 11 years of experience in many leading international Pharmaceutical Companies rely on us for technological knowledge and integrated solutions. After the years of experience and request of some of our valued customers, we started manufacturing granulation equipment in 2010 to provide complete capsule production line with the focus on providing highest quality products.